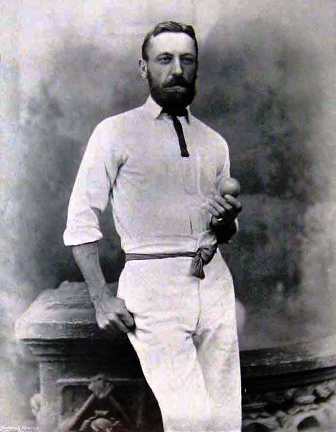 Richard Gorton Barlow (1851-1919), Cricketer. IN a large house in Southport, close to the cricket ground where Lancashire play each year, is a stained-glass window portraying three of the county's most famous players of the last century, R. G. Barlow, A. N. Hornby and Richard Pilling. For years the window was in the vestibule door of Barlow's own home in Blackpool, presented to him in the 1880s. It was just one of hundreds of items Barlow collected through the years, and on his death in 1919 most of his valuable cricket souvenirs faded away with him. Barlow was buried in Layton Cemetery, Blackpool, his resting place topped by one of cricket's most famous headstones, one Barlow designed himself. I first came across it six years ago when I lived in Blackpool and was wandering through the cemetery close to my home. Near the main entrance stood the large white stone showing a set of stumps with the ball passing through middle and leg and at the bottom, three little words . . . "Bowled at Last"! Barlow had made sure the stone would do him justice, choosing the words himself: "Here lie the remains of Richard Gorton Barlow, Died 31 July 1919, aged 68 years. For 21 seasons a playing member of the Lancashire County XI, and for 21 seasons an umpire in county matches. He also made three journeys to Australia with English teams. This is a consecutive record in first-class cricket which no other cricketer has yet achieved." Barlow would have liked to have added much more, but unfortunately there wasn't room. He was born at Barrow Bridge, Bolton, in 1850. By the time he was 21 he was professional at Farsley near Leeds and in that same season, 1871, he played his first game for Lancashire. He became a solid, stubborn opening batsman and no doubt would have liked to have told on his tombstone of his feat of carrying his bat through the innings more than 50 times. The term "stonewaller" arose through Barlow batting two and a half hours for five not out against Notts "on an extremely bad wicket" at Trent Bridge in 1882, a feat recorded in the Guinness Book of Records. 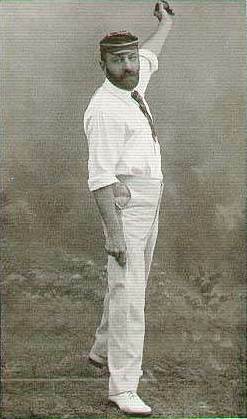 "Bowling at thee were like bowling at a stone wall," said Barnes, one of the Notts bowlers, who toured with Barlow on two of his visits to Australia. Barlow played his cricket in an uncompromising fashion, a hardened Northerner who did not believe in walking and who had no hesitation in running out a batsman backing up too far. He claimed more than 12,000 runs and 1,000 wickets, but for all his fine reputation as an opening partner with his captain, "Monkey" Hornby, he scored only two centuries for Lancashire. When I tried to trace descendants of Barlow some years ago, a letter in the Blackpool evening newspaper produced a reply from Barlow's grandson, Leslie Barlow Wilson, initials purposely contrived by the cricket-loving family. He recalled the walls of his grandfather's home being so full of photographs and mementoes you could not get a pin between them. I had been told that Barlow had had only one child, Alice, but her son, "L.B.W. ", put me on to a son that few people know a about. This was R.G. 's illegitimate son, Reginald Gorton Barlow Thompson, who lives in Southport, a sporting man whose major interests have been motor cycle and motor car racing. "My father was very unhappily married," Mr. Thompson told me. "It was on one of his regular morning walks along the cliffs at Blackpool's North Shore that he met my mother, the bookkeeper at the Imperial Hotel, Blackpool, and a very beautiful woman. They fell deeply in love and I was the result." Young Reginald was brought up by his mother. But R. G. Barlow's wife died six years after the boy was born, and Reginald lived with his father and mother until Barlow's death in 1919. Reginald was then eight, but the vivid impressions his renowned father made have lived and grown with him through the years. "He was an autocrat," he recalled, "And a man very proud of his many achievements, and whose whole life was cricket." Barlow's devotion to the game was shown in the house he built in Raikes Parade in Blackpool for £1,500, His initials were carved in stone over the door, his stained-glass window greeted the visitor at the vestibule, and a gas lamp in the hall showed the names of famous Lancashire players, plus W. G. Grace himself, who was dismissed by Barlow 31 times. The walls of the hall were covered with historic team pictures. Lord Sheffield's ground was depicted in tiles in the dining room, and by the fireplace, also in tiles, were portraits of Hornby, Barlow and Pilling. "I had several items and some of his gold medals left to me in his will," said Mr. Thompson. "But I had to wait until I was 21 to collect them and I have treasured them since." He had to wait until 1948 for his prized possession, the stained-glass window that now stands on the landing of his house in Weld Road, Southport. "My half-sister, who was 40 years my senior, refused to let me have anything while she was living, and when father died the vestibule window was built into a summer house at her home. After she died I went along to the house and offered the new owners stained-glass windows throughout the house in exchange for the old vestibule window." He also has three bats, one of which travelled around the world with Barlow in 1881-2, and was "carried" in six innings and made 4,000 runs. He also has cups, tankards, and a delightful silver mounted gong presented to Barlow by W. G. Grace "for his fine cricket against the Australians in 1886'. An unusual item is a cap which belonged to the Australian captain W. L. Murdoch in the 1880s. "He took off his cap and gave it to my father in admiration for him after England had won the Ashes," said Mr. Thompson, "and that led to the saying 'I take my cap off to you'. SINCE THIS ARTICLE WAS WRITTEN THE WINDOW HAS BEEN REMOVED FROM THE HOUSE AND IS NOW AT OLD TRAFFORD - To view the window click here.